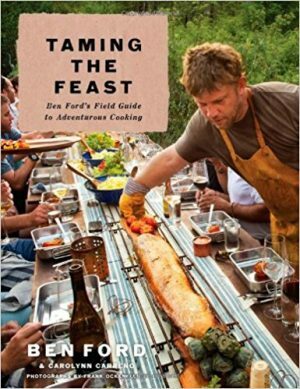 Ford’s food reflects his passion for artisanal techniques, innovative combinations of flavors, and seasonal ingredients. Delicious sides, including Avocado Crostini with Tomatoes, Capers, Olives, Almonds, and Arugula, Persimmon Salad with Goat Cheese and Candied Pecans, Cheddar Cheese Loaf with Artisanal Ham and Spicy Brown Mustard, complement hearty main dishes. Each feast ends on a playful note with delicious desserts like classic S’mores with homemade marshmallows and graham crackers and Coconut and Banana Cream “Pies.” Each chapter also includes creative recipes to make use of the leftovers you’re sure to have.